Serving Elmhurst, Villa Park, and Oak Brook, IL (Illinois) and surrounding areas – Dr. Matthew Blass is your general family dentist, offering quality dental care for children, teens, and adults. 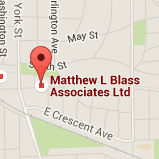 Professional, comfortable, and family friendly – our team at the dental practice of Dr. Matthew Blass is dedicated to creating an exceptional dental experience for you and your family. Dr. Blass is a second-generation dentist, carrying on the traditions of high quality patient care since the opening of the practice in 1968. The goal of our practice is to make sure that our patients receive the care they need and deserve, and to make sure that our patients feel welcome and relaxed during each office visit. We offer a variety of treatment options designed to help you maintain the look and feel of your natural smile, including teeth cleaning and exams, teeth whitening, root canal therapy, fillings, crowns, implant restorations, and Invisalign® invisible braces. When it's time for your next dental checkup, please contact our practice and let us make you smile!